A moving exploration of projecting thoughts into existence, of transforming intent into reality. More an experience than a straight-forward Problem and Solution narrative, Paterson is a joy for creatives who act as Antagonists in their narratives. For anyone caught up in the resistance brought about by the void of speculation and guesswork, this latest film by Jim Jarmusch provides an opportunity to know the flow available when one projects art into life. Consistent with a holistic perspective, both Problem and Solution present themselves throughout the narrative. The typical Linear approach employed by most Western storytelling establishes Problem first before proceeding forward through Symptom and Response. At the climax, the Solution rises and quashes the Problem–resolving all issues. 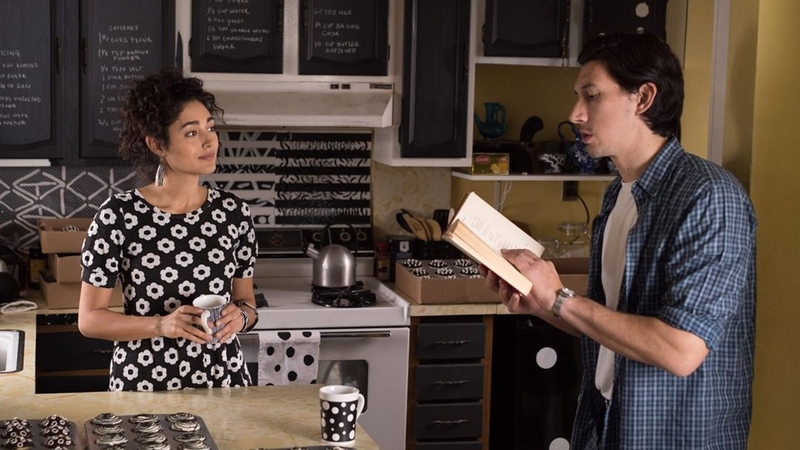 With the more balanced Holistic approach present in Paterson and in Paterson’s Main Character Problem-Solving Style, both the inequity of the Problem and the equity of the Solution manifest simultaneously from beginning to end. Paterson’s “change” is less leap of faith and more a shift in balance towards a different option. A change of direction that maintains flow, rather than a perfunctory switch that alternates current from Problem to Solution. Paterson (Adam Driver) suffers from a lack of Speculation. The Dramatica® theory of story defines this particular area on the narratives spectrum as an extension of possibilities into the future and “surmising possibilities.” The inequity in Paterson’s life stems from a lack of speculation, a refusal to entertain the possibility of one of his poems rising above a place in his secret notebook. Paterson awakes and grabs his wristwatch. Free from notifications and Twitter feeds, this anarchic device and his lackadaisical morning ritual reveal a lack of conjecture and his Main Character Problem of Speculation. Sometimes he rises at 6:10, other times 6:25. The passage of time is something to be experienced, not guessed. Ample opportunities to experience the balancing Solution of Projection appear throughout his day. Dramatica defines the Element of Projection as an extension of probability into the future. This anticipation of how things will be presents itself the moment his girlfriend introduces the idea of twins in their future. Now, everywhere he looks he sees twins–a clear manifestation of intent and an indication of relief through Projection. Like most people, Paterson fails to recognize the positive aspects of this shift in direction until a greater knowing arises. Content with focusing on balancing simple inequities, he lives his life mindlessly and without purpose. Consider the tilted mailbox. Paterson returns home daily to find the mailbox leaning, and off-kilter. By rout, he rights the offender and crosses the threshold leading inside. This Main Character Focus on Inequity and Main Character Direction of Equity happens without speculation and conjecture as to the culprit behind the act. Confronted with the warning that his girlfriend’s dog commands a high price in the dog-jacking community, Paterson refuses to join in with the thug’s ominous speculation. ”Well, I guess I have something to look forward to” is all the response Paterson offers. Consistent with the Main Character Approach of Be-er, Paterson prefers to adapt himself to his environment rather than seeking to change things in the external world first. He wears the mental groove of personal adaptation deep, looping around and around without moving on to the next track, unwittingly stuck within a Main Character Domain of Mind. Paterson is not the only one on a path towards realizing self-identity. Day workers sit side-by-side on his bus, discussing missed opportunities with “gorgeous” women and an unspoken realization that they could have tried harder. A young girl, like Paterson, keeps her poems a secret as she develops her voice. An actor feels empty without the woman who defined his existence. A bartender plays a game of chess against himself–and finds himself losing. In each of these examples, Issues of Sense of Self and Concerns of Conceptualizing rise to the surface; the Focus on Desire granting a shift in Direction towards Ability. The Dramatica theory of story recognizes Desire as the motivation to change one’s situation or circumstances and Ability as the innate capacity to do or be. The canned male response What are you going to do?” in response to the wavering affections (Desire) of fickle women help define the lives of the day workers through a recognition of Ability. The actor uses every last ounce of his talent (Ability) to win the heart of his beloved (Desire) and reintegrates her back into his concept of himself. The bartender stirs the hornet nest of his wife’s passion for a better life (Desire) with an attempt to hit it big on the back of her savings (Ability). These tableaus of unbalanced psychologies focus Paterson’s narrative into an Overall Story Domain of Psychology and an Overall Story Problem of Speculation. The total of their shared experiences vibrate along the same inequitable frequency as Paterson, yet present themselves objectively and from afar. The objective understanding of too much Speculation their stories show harmonizes with Paterson’s distinct and personal lack of Speculation. Paterson, the bus driver, mindlessly maintains balance. Paterson the city breeds imbalance. Professional boxer Rubin “Hurricane” Carter, a former resident of the suburb, inspires two children with his shotgun shooting spree. Comedian Lou Costello of Abbot & Costello fame, also a hometown hero, upset auspicious beginnings with a rise to stardom. These accounts, and much more challenge Paterson’s approach through their shared Influence Character Throughline perspective. Everywhere he looks, Paterson finds his true self reflected back at him—the mirror at the local dive bar, crowded with newspaper clippings of small town made big, taking this responsibility literally. Girlfriend Laura (Golsheifteh Farahani) drives the bulk of this perspective into Paterson’s awareness. Always in a state of unrest, she switches from one passion to the next, exploring and developing her abilities to make her dreams a reality. The Influence Character Problem of Inequity identifies the nature of her motivation and the driving force behind her influence over Paterson to develop and grow. Her Influence Character Focus on Desire (her passion) and her Influence Character Direction of Ability (developing her “talents”) synchronize with the same two elements in the Overall Story Throughline—consistent with the subjective perspective that Remains Steadfast. The Relationship Story ThroughlineRelationship Story Throughline, a perspective on the relation between Main Character and Influence Character begins with the cohabitation of man and woman and extends out into the physical world. Sharing a park bench while watching the flow of water through the city of Paterson, New Jersey, defines a mutual Understanding found in the Relationship Story Concern of this storyform. The waterfall also speaks of the Relationship Story Catalyst of Senses—the sight and sound bringing fellow artists closer together. “uh-hah…” the visiting Japanese businessman responds—as if a greater knowing of Paterson and their shared relation to the world around them extends their bond with a Relationship Story Solution of Knowledge. The only form of resistance—and resentment—appearing in the daily chore of walking Laura’s dog Marvin; a clear indicator of a Relationship Story Inhibitor of Circumstances gumming up the works between them. The experience of watching Paterson is one of expansion and accumulated knowledge. For those of us stricken with a predominantly linear mindset, the narrative structure of this film requires observation through the peripheral—a direct approach undermining the value of its holistic understanding. For those gifted with a holistic lens, Paterson affirms their appreciation of life in flux, a gentle nudge rippling out in an ever-widening sphere of influence. Regardless of filter, Paterson is a nice validation of narrative’s ability to transform ideas and thoughts into a shared purpose and intent. Observe the film through the eyes of the storyform identified here, and then observe it again but consider the movie itself the Influence Character, you the Main Character, and the relationship between you and the film the greater Understanding offered by the Relationship Story Throughline.